and the Gorilla Gripper, the innovative panel carrier which provides a safe and easy way to lift and carry plywood, drywall and other cumbersome sheet goods...from the top, with one hand. These two unique inventions, the Gorilla Gripper and the self-adjusting, self-locking step ladder, have been featured on the History Channel's program "Invention USA." 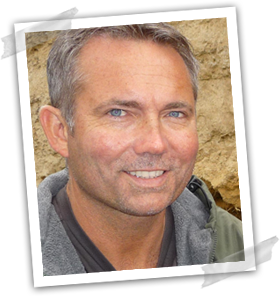 All of my innovations are inspired by real-world problems that I or co-workers encounter on a regular basis. Here are two photos of the Landon Ladder 'in action'. If you have any questions contact me using the link below. You can also click the link below to learn more about the Gorilla Gripper. Take a peek at the Landon ladder. It's a dynamic new concept in step ladders...a ladder that is self-adjusting and self-locking. Just set it down and all four feet are solidly in contact with the ground, eliminating surprising and dangerous wobbling when climbing. It allows the user to position the ladder right at the specific work location (rather than on the nearest patch of flat surface), eliminating the necessity of over-reaching which too often causes a loss of balance and risk of a fall. 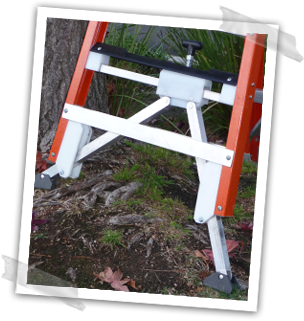 It also provides an extra sturdy A-frame designed base with a wider stance than a standard step ladder, thus a more sturdy and stable ladder! 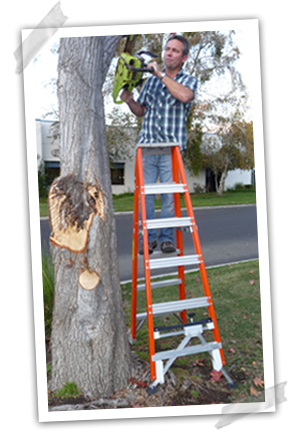 Self-Adjusting The Landon Ladder was created to be self-adjusting and self-locking. This permits placement on virtually any surface with great confidence. Safe The Landon Ladder is designed to assure that all four feet are securely planted on the ground, versus the risk with a standard step ladder of only 3 feet being in firm contact with the ground, leaving the fourth foot to sit slightly or grossly above the ground, creating an obvious risk of wobbling or rocking when climbing. Stable The Landon Ladder can be used effectively on grass, hillsides, construction sites, dirt, rocky ground, ramps, curbs and other uneven and high/low surfaces. Strength The Landon Ladder is surprisingly strong and light weight. It exceeds all ANSI standards for safety, yet remains light and easy to carry.